Say goodbye to plastic cutlery and hello to SpudWare—cutlery made from 80% potato starch and 20% soy oil that’s just as heat resistant and every bit as strong as plastic cutlery. The kicker? It biodegrades in just 180 days! SpudWare can even be washed and reused, so you can eat your potatoes with potatoes for months to come. In the US, a party pack of 50 spoons, 50 forks and 50 knives costs just $20 at Treecyle, readers in the UK can purchase potato starch cutlery from online retailer Vegware. Interested in buying in bulk? Spudware is available at wholesale from Califonia-based wholesale distributor Excellent Packaging & Supply. Each SpudWare purchase from EPS comes with a Certification of Compostability from the American Society of Testing and Materials. 44. whoah this blog is great i like studying your posts. Keep up the good work! You recognize, a lot of people are searching round for this info, you could aid them greatly. hello i am doing an interview for my global studies class on companies promoting global change. i would like to ask you a few questions about your company and what you are doing to help the world on a global scale. 1. how is your company different from other companies that are doing similar things? how is your company more effective/environmentally friendly? 2. what kind of materials do you make your product out of, and how good is it for the environment? 3. how does your product have a positive global effect on the world? 4. what kind of big organizations use your product and how much has it caught on? Survive in The Woods With A Plastic Fork And Some Lint "Well, here you are lost in the bush again. How did you get there? Beats me. Too bad you didn’t bring a survival kit or some gear. After a quick inventory, you have managed to find a plastic fork and a ball of lint from inside your pockets. You’re screwed, but it could be worse. You could have nothing at all. ... You build a shelter and a fire.... Alright, so you now have shelter and a fire. But what about your plastic fork? Surely there is some use for it, right? Of course there is. Hopefully you’ve caught a few episodes of Oz, because this is going to require some prison ingenuity. "Grab your plastic fork and head over to your new fire pit. Look around and find yourself a small, dry stick that you can use as a “match”. Light that bad boy on fire. Got it? OK. Now begin gently heating the handle of the fork. It’s important to heat the fork very gently because the plastic will start to burn if it gets too hot. When the plastic begins to soften, gently form the handle into a blade shape using your thumb and index finger. Take your time and do a good job. Once you have the fork formed into the desired blade shape, allow the plastic to cool for a while. Now the final step. Find yourself a big rock. Not just any rock will do. It needs to be the smoothest rock that you can find. Once you’ve picked your rock, you can begin the process of sharpening your plastic fork. Just sharpen it as you would any other knife. Once you’re done, you’ll have the next best thing to a real knife. Hey, if it works in prison, it can work in the woods too. Now go shank some wildlife." (shoutwire, nd) --Heck, I don't have a plastic fork, I only have my Spudware -- WWGMD? [...what would grandma do...] Well I could distill it into Vodka! Yay, I'm saved! Hey Goldfish, while there are many imitators, there is only one SpudWare! The cutlery at Whole Foods is not SpudWare if it gets mushy in heat. And composting SpudWare does need green waste. Like any other brown material (compost has to have equal parts of "green" (fresh nitrogen waste) and "brown" (woody carbon source), it needs to be shredded. With moisture, enzymatic action and the heat that ensues, SpudWare is being composted at many sites across the country. spudware is a great idea, however its unpleasant to use because it smells. I really think we need to be wary of using items that are made from food sources. Sure, these items have a lower impact on the earth, but how many more people will go without basic starches because we are now making forks, spoons, sporks and fpoons with them? Great news! My spud spoon is finally sprouting some mold! I'm pretty sure that it started growing on the food residue and whatever fell into the jar of water. The mold seems to be working its way into the blade of the spoon, which is starting to puff up with water. I guess they do biodegrade after all. I have another one stuck into the compost box of coffee grounds. As for usability, I think the spoons are great. I have been using a few of them for months on a weekly basis. The tines of the forks tend to get twisted up. The biggest usability issue is that their pasta-like feel and taste practically *begs* you to gnaw them into uselessness. aplagueofboil : I'm not suggesting boiling as a means of disposal. I just want to see if the claims of "biodegradable" are credible or not. Besides, who says I can't use a solar oven? Is this edible? Id like to eat it. This looks great! What an excellent move for the environment. What a great invention for our environment! i've used these at a whole foods market. they are not as sturdy or as heat resistant. the tines on the forks bend off if you use it on anything tough, and ive seen the spoons become flimsy in hot soup. the knives are kind of a joke for cutting meat, takes twice as long. nice idea, just doesnt seem to be perfected yet. I have sometimes heard that the amount of starch in a 'norma' potato is not enough to make its industrial use economically viable. How about the plants used in this product, are they genetically modified? Great Photo ! Those fork prongs LOOK like french fries ! Hey.. I guess in a way, they ARE ! What I want to know is can we reconstitute those suckers after 180 days and have some greasy mashed potatoes, or something !?!?! Now THAT would be IT ! Eat today... and eat the utensils tomorrow ! Yeah ! THAT"S GREEN TO THE MAX !!!!!! Like Russell, I'm at UCLA and I've also been doing some experiments. I buried a spoon halfway in some dirt - after about a month or so, it got kinda brittle and crumbled/powderized when stressed. This was during a dry summer so I don't know if moister soil would've had a different effect. It was a sunny patch of dirt, though, so maybe UV had a role. I've had another one sitting in my drawer here for a few months now (since June-ish) and it shows no signs of wear at all. I use it to stir teas and such a few times a week, though I do wipe it off after use. I guess I was hoping for more dramatic biodegradation- the display near where they are dispensed clamed biodegradation within 40 days or some such. I think the 180 day figure cited above is closer. The free (donation priced) lunch that the Hare Krsna's serve out on the U of F campus in Gainesville has been using these for almost a year now.. they stand up pretty good to heat. Although Aesthetically the grip and chunkyness isn't perfect. In the whole discussion I am missing the point of why using disposable cutlery at all! Guys, why don't you use (stainless steel) cutlery. No need to compost it after a couple of uses, just wash and reuse it for decades. I even do that for parties with a lot of people. Same goes for glasses. First guy: why would you boil these if your goal is sustainability? The gas that you burn while boiling them, the warming effect of it, the air pollution from it is somehow outweighed by getting a piece of potato to decompose faster? I go to the UW and we use fully biodegradeable utensils. I have no idea what ours are made of, but I don't think it is potatoes. In any event, the utensils are terrible against heat. You can stick your fork into a fresh bowl of pasta and have it rendered comletely useless in a matter of seconds. boy i wish we had SPUDWARE! $20 for fifty of each utensil? Call me when it's down to $5. Neat, but waaaaaaaaaaaaaaaaay too expensive when compared with traditional plastic utensils. OK, now lets get SpudWare to make lids for EatWare compostable food containers, and we have compostable packaging and utensils for all fast food. Goodbye styrofoam. Brilliant design, I wonder how sturdy it is. How many times can you wash them..? "If, if, if...." In the real world MOST people do not distinguish one plastic from another -- and, indeed, the human and mechanical seperators at the waste processing plants can't either. So, it will either go to a large scale landfill (not a composting site) where the moisture and mix conditions don't exist for short term composting (just methane production) OR to a power generation plant. AS COMPOST, it needs to be put in with GREEN WASTE and the like, and it will indeed break down into fertilizer sometime in the middle of next year (in order to get the industrial-standard label of "compostable"). Most compost processing centers turn over material within that time. And Cargill and other agro-conglomerates that have the major stakes in these technologies are unclear to us the public on the cradle-to-cradle costs of growing and producing these so-called recyclables. 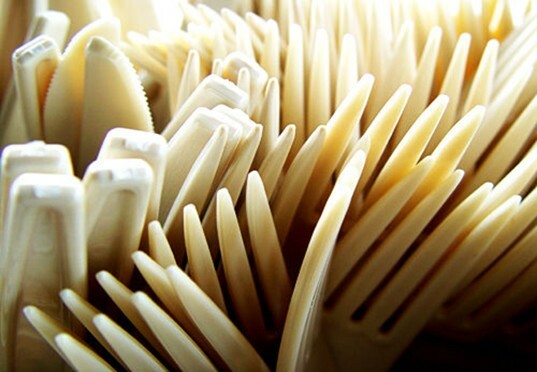 I recently left a comment on another blog re: biodegradable disposable cutlery/ dishware, so I feel it is only fair for me to do the same on the site that I write for... 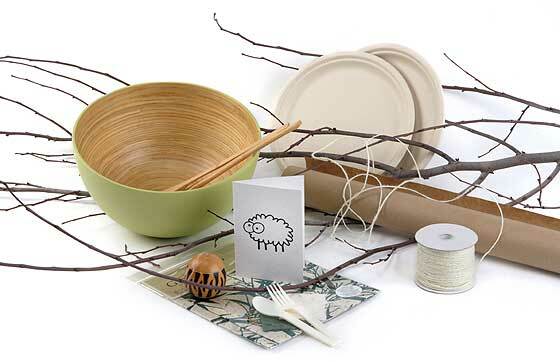 I agree that biodegradable products are a step in the right direction, however nothing biodegrades in a landfill. I think part of creating awareness is acknowledging that without a system in place to deal with these products, either recycling them or composting, it is an incomplete solution. Creating these systems, however, I fully acknowledge, is beyond the realm of the average citizen, but will require business and governmental involvement and no doubt take some time. I completely sympathize with not only reporting on a complex issue with many gray areas, but also trying to be a good consumer in a world of incomplete solutions. It is frustrating to be excited about a product, but then realize at the end of the day it is still "garbage". I suppose, at least, potatoes are better than petroleum. I'll be interested to know how Russell's experiment goes ... as it regards "real world" biodegrading of the product. I'm also interested to know how green [or not] the manufacturing process is for the spudware + other EPS products. Anyone know? Cheers J. "The biodegradable spudware utensils are excellent for hot items like soup. They have the look and feel of plastic and outperform plastic in boiling and microwave testing and are biodegradable." -from the Treecycle link. So, I think boiling it will not help. I think it just needs UV exposure and/or perhaps some friendly bacteria? I've tried similar products from Whole Foods, and they're pretty decent and last a while. Glad to see the cost is more reasonable though. UCLA uses these at some of its campus eateries. They feel (and taste) exactly like dried pasta gone slightly stale. Not at all unpleasant, and the taste of even bland food completely overpowers it. Given how much they remind me of pasta, it's surprising how resiliant they are. I have a spudware spoon submerged in a jar of water on my desk right now. After a week under water, it isn't yet showing signs of disintegrating. If nothing happens after a month, I'm going to try boiling it. If that fails, I'll guess I'll try sticking it in the compost bin with the coffee grounds. Maybe they need a little acid to start breaking up. They need to put this stuff in MREs. The amount of packing that goes into those things is frightful. It would be nice if some of it could degrade.